Ever felt that the climate problem is too big an issue for you to contribute to? I certainly have felt that way. When you look at the number of people, cars, planes and factories, it’s hard to feel that what you do as an individual can really put a dent in reducing the number of emissions that we all impact. Well, one thing you can do on a daily basis that will add up to a big impact is the food choices you make. I’m a member of the Vegans of Australia Facebook Group and, in the last year, the number of members has more than doubled, from a starting point of 23 thousand, to almost 60 thousand members. So why the growing interest in eating plants? Well, one of the big drivers is that fact that we eat is a big part of the climate puzzle, and eating plants leads to a lot less greenhouse gas emissions that eating meat. The good news, though, is that we don’t need to all be vegan or even vegetarian to make a difference. Just simple swaps like substituting a beef burger for a veggie burger once a week or eating fish instead of beef add up to big savings for the planet. The key, key message is that ‘eliminating 90% of your meat intake is a lot more important than eliminating all of your meat in take’. The chart below highlights the impact different diets have on the environment. A vegan diet has the lowest, but you can also see that the Mediterranean diet isn’t that far behind (middle bar). 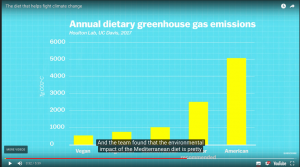 The chart above was taken from a great video packed with other facts and figures to help you embrace a more flexitarian way of life to benefit your own health and the health of the planet. Together, we can make a difference. I hope you enjoy the video. You don’t have to go vegan to fight climate change. Research shows that small changes to our diets can make big differences. 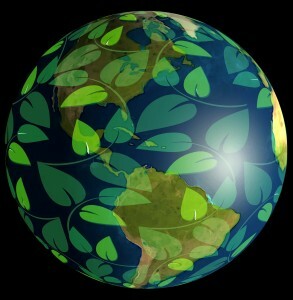 Climate Lab is produced by the University of California in partnership with Vox. Hosted by conservation scientist Dr. M.